"Sorry Ping, but you need to go to Thailand for 2 weeks." My supervisor looked really serious. I tried to look nonchalant. "Ok when?" It was 3pm in the afternoon. Man my life is interesting. I don't rank comics by star ratings, but I do sort them into categories based on how I perceive them. What a Find! - Comics with special and unique characteristics that enthralled me, and which I can whole-heartedly recommend to others. Place of Interest - An enjoyable comic that while wasn't earth-shattering and might have some flaws, is a worthwhile read if you have some time to spend. Lost in Transit - A comic that has both positive qualities that might endear it to readers, and negative qualities that might drive them away. It's like Marmite, either you like it or hate it, there is no in-between. Weekend Day Trip - A comic that was not really bad, might have been quite enjoyable to read but was lacking on the "memorable" front. A read-through is an entertaining way to spend a few hours, but ask me about it after a long time and I might need a few minutes to remember I read it. Under Development - A comic that is too new to be evaluated properly, so contents of review may be inaccurate later on. Tourist Trap - Comics that I did not enjoy and cannot in good conscience recommend to anyone. I was just letting you know about this webcomic that's been out for a minute that's pretty funny (at least, I think so. I'm the creator.). It's called ADDANAC CITY, and it's about a seven-year-old kid named Hank who always seems to get into hot water with his friends, family, and school officials to comedic effect. Check it out if you wanna. I update it 5 days a week, Monday thru Friday. Currently, I've also been updating the site with strips on the weekends during December. The link is www.addanaccity.com Hope you enjoy! Incidentally, I should mention that when I do Postcard reviews, I tend to be more critical than in my normal "Journey Leg" reviews. This is because when I do those, the creator never asked me to review their comic in the first place, and those reviews are geared more for readers looking for new comics . Postcards are different however, and the assumption I make is that they are more for the webcomic creators themselves and the requester is after criticism and feedback. I understand you on that one. There are a whole lot of web-comics out there that I don't like either. However, there some I do. Maybe ADDANAC CITY will be one you will, at least, appreciate even if it's not your cup of tea. We'll see. I just wanted to let you know about a webcomic that I create called "Addanac City". The strip features seven-year-old Hank Addanac, a wild n' wacky 2nd-grader who constantly finds himself in hot water with his parents, friends, and school officials. I would love to get some feedback and/or a review whenever you get the chance (positive or negative). Call this odd, but didn't I receive an almost identical email from you on the same subject about a month ago? In fact I think I replied it. Can't really say anything different this round, except that the comic is indeed in my postcard waiting list. There's only a couple of comics in front of you I think. Anyway, thanks for your email. I guess that was a subtle hint I need to speed up my postcards replying rate. I should mention that even before I had a look at the comic I had a feeling I wasn't going to like it. It sounds like I'm prejudging, but let me explain. When someone describes their comic and tries to tell you "it's pretty funny", I start feeling suspicious. It's the same kind of feeling I get when an salesman approaches me saying "Good day, Miss! I have an offer here that I'm 100% certain you will love!" Maybe it's the part of me that resents being told how to feel. I'm ok with people describing a comic as a "humour comic" or "I found this comic funny". But when you tell me a comic is a funny comic, I get skeptical. It's not the same thing, you understand. one is an opinion. One is enforcing your opinion on someone. The difference between them is the difference between being recommended something and being told that you should like something. It's also the difference between being recommended and being offended. Basically, if I want to feel that X object is funny, good, or worthwhile, I will be the one that decides that, thank you very much. Anyway, little rant over. Let's go see what this comic is about. Well, I don't know about the comic itself, but my first impression was: "Wow. This is a prime candidate for How Not to Present Your Comic." I showed this page to a mate of mine who described it as "the most zen-disrupting page they had ever seen". The site is very badly laid out. Let me rephrase that with less understatement. This isn't a comic page. 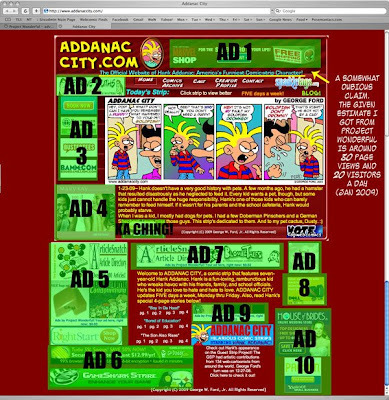 It's a badly compressed thumbnail of a comic hiding in an obnoxious online equivalent of a classified ads with and even more obnoxious self-adulating tagline: The Official Website of Frank Addanac: America's Funniest Comic-strip Character! Ho-kay. Let's start with the comic presentation. If you click on the comic, you get the full-sized thing, which is slightly better than the badly compressed image that most people won't realize is a thumbnail. They'll just think the creator doesn't know how to compress images. The thing to remember is that your comic is the MOST important thing about your page. Give it prime space. Even if you do not want to put it on front page, make a nice cover page instead. But your comic is THE MOST IMPORTANT THING. NOT YOUR ADS. Yes, everyone wants to make a little money off their comic, but the number of ads in this one is way over the top. Everyone needs to eat, but in the world of webcomics, this kind of over-excessiveness screams to your potential readers that the creator is in this for the fame and not for the love of the art. Whether it is true or not does not matter, because in a net full of other webcomics, first impressions count the most. And the first impression this comic page gives make me want to hit the "back" button and never want to come back. Let's move on to the dubiousness of the claim on the tagline. How does one even qualify as "America's Funniest Comic-strip Character"?! Did the poster of that tagline do a survey out of all Americans? Was it just based off the comment of a handful of readers who found the comic amusing? Or is it there because someone thought it sounded professional and impressive? I am being harsh? I don't think so. Selling your comic is one thing. Pretentiousness is another. It's like the local kebab shop or chippy claiming it's a Michelin 3-star when anyone can see it's not. It puts people off. They may like kebab, but no one likes being told something is something else when they know it isn't. So you end up losing people who might have read your comic but got peeved because they felt misled. Speaking of misled, for a comic that claims to be funny, I found the level of humour rather absent. There's a lot of old, rehashed attempts at jokes that reminds one of the Sunday funnies you read in the news papers. Except well those stopped being funny a long time ago. Well, I'm quite aware that humour is subjective, and my sense of humour may not be the same as other people's sense of humour... for example I find stuff like "Happy Tree Friends" crass instead of funny. Still, while my sense of humour might be slightly kooky I have learnt to recognize what makes other people laugh, even if I don't find it funny personally. And my gut feeling is a lot of people who read this blog won't find it very funny either. The navigation of the site is non-existent. It's just a bunch of links to the images, which are hosted on... Photobucket. Well, at least they don't have to worry about exceeding Photobucket bandwidth limit at this rate. One thing that I do notice about Addanac City however, is that there has been a lot of effort (mayhap misguided) put into it and you can definitely feel the enthusiasm of the author in his work. I can commend the the zealousness of the creator at his task of updating the comic 5 days a week, which everyone who has ever done a comic will know, is not easy. While the art style I personally dislike, (personal opinion only) the lines are cleanly drawn and the colouring and detailing isn't bad. Given time, and if he keeps on drawing, he will probably improve. That is, if he learns from his past work and critical feedback. But first, he needs to get his head out of the clouds and stop giving himself congratulatory thumps on the back. He needs to learn to present his comic for what it really is. Not what he thinks it is. Phew, and that was one of the tougher postcards I've ever had to write. Anyone who knows me will know that I am a terrible correspondent. I tend to leave requests a bit long on reply, so here's one of my earlier comic review requests. In fact, this was one of the ones that got me started on the whole Postcard thing. webcomic miniseries I would like you to consider taking a look at. enough for you to get a sense of the characters and plot. The comic is located at http://www.coderedcomics.com. This is a portal site of the many webcomic projects. At first glance it's momentarily confusing but after the initial "Umm... which one is it again?" I found my way from the hover option menu on the left. Thankfully there is a link there to start from the first page. The cover page, the first page, is a very important page. That's the point where people either decide to go on, or hit the back button or surf out of the site. The art is definitely promising; clean lines, full colour, nice style. Well I say the art style is nice. The composition however, is less impressive. It's nicely drawn, but a few characters standing around with bored expressions against a planetary background is kind of... well... boring. A cover is supposed to draw you in and make you want to read more, not act as a cast page. Nevertheless, it passes the test. On we go. The second page is a chapter page. I'm not a big fan of those, and when I do see them I like them short and sweet, or with something profound. Or both. I'm here to read a comic, having to read a bunch of text to start off doesn't necessarily put me in the right mood. This seems to be a conversation here, but the all black page and white dialogue text is severely uninteresting and I really don't want to read through it. At the very least pop some still objects into it. I like the concept, but the execution of the chapter pages could improve. Well as far as I can tell the story is sort of an Ocean's Eleven kind of thing, set in space. Unfortunately the introduction to the story IS rather choppy and confusing, so it took me a while to figure that out. The character introduction is almost overwhelming, too many (especially unnecessary ones at this point) too fast. Most people I know are guilty of this, including yours truly. We tend to forget that because we know the characters too well before we start. All that said, now that I've learnt that fact, it shouldn't happen if we can help it. The characters seem borderline stereotype, but I am sure that's merely because it is new. After all, most characters do start off as stereotypes and develop into distinct individuals later on. Which brings me to the other thing. Improve the posturing and composition. The art style is already good, and the inking and coloring is as well. The postures are improving, just more work needs to be done on the facial expressions. Slow down. Jumping from scene to scene is the first chapter was confusing. A new reader needs time to get oriented, so give them a bit before you try to pull off too many scene-jumpingQuentin Taratino-que time mixups. At the present a second read through sorts of helps things fall in place, but a really good comic shouldn't have needed that 2nd read through. The chapter pages need more work to make them 1) shorter and to the point OR 2) Attractive enough to take the time to read though all the dialogue. Otherwise the tendency to skip them is a little high. I like how only 3 main characters were introduced first, but in my opinion, there was still too much detail given to the characters that were unnecessary at the point they were introduced. Keep in mind when a reader is new they can't tell the difference between extras and main characters, so it helps to make it obvious which is which. But it might be worth checking out sometime in the future. You can't really judge a comic by its first issue, the same applies to webcomics. I guess only time will tell.